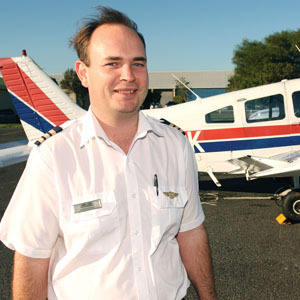 Flight instructors tutor, teach, instruct and lecture how to fly different types of crafts. They demonstrate and explain two basic principles of flight, aerial navigation, weather factors, and flying regulations both on the ground and in the air. They use flight simulators as well as dual-controlled crafts for demonstrating operation of aircraft and equipment. They observe solo flights and determine each student’s readiness to take examinations for licensed ratings. They also assist advanced students in acquiring advanced ratings such as commercial, instrument, multi-engine and air transport ratings. teaching students current laws, regulations and safety standards. Why did you become a flight instructor? Since a very young age I’ve had a love for aeroplanes and an obsession with flying. My parents thought it was a phase I would outgrow… I’m still trying. I was fortunate to have the opportunity to pursue my dream, which became my profession. What training did you undergo? I started with my Private Pilot License during my matric year. After obtaining my PPL, my dad agreed to assist me financially in getting my Commercial Pilot License, but only if I proved my commitment towards training by passing all CPL ground school subjects within a specified period with NO flying. Three years later, I completed my instructor training. Are there particular personal attributes a flight instructor should possess? You need to have a lot of passion and determination; to be self-confident but always remain humble. What do you enjoy the most? I love the fact that I’m living my childhood dream, and also being able to share this dream with the people that I teach. Has there been a career highlight? I was recently nominated to represent general aviation on the General Aviation Safety Initiative Committee. Care to share your future goals? To remain involved with flight training, whilst working towards a career in aviation safety. What advice would you give to someone starting out in your career? Just be passionate and believe in yourself, then the sky is the limit. Describe your job in three words A satisfying privilege. The first step to becoming a flight instructor is to get a Private Pilot License (PPL) with a Night Rating plus 100 hours of solo flying. This course combines theoretical learning with practical training. The next step is to obtain a Commercial Pilot License (CPL) at an approved advanced flying training organisation. This course involves theoretical examinations written at the Department of Civil Aviation, a practical part done by the Designated Examiners, and 200 hours of flying experience. Graduates with a Commercial Pilot License (CPL) can then go on to do instructor training.